High-speed pellets made from quality alloy! Up to 30% faster than lead! RWS Hyper Max Pellets use a high-tech, totally lead-free alloy, perfectly molded and brilliantly finished to deliver amazing results. 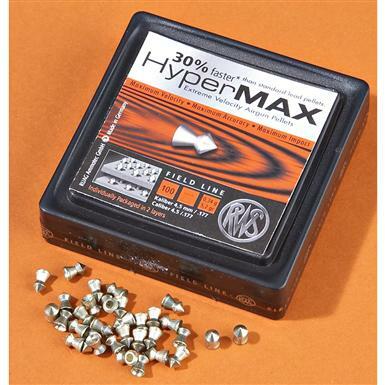 Hyper Max is packaged in a special case to prevent pellets from touching. You won't find marring, denting. RWS HyperMAX Pellets, .177 Caliber, 4.5 Grain, 100 Pack is rated 4.8 out of 5 by 26. Rated 1 out of 5 by tho4 from Expensive but jams your gun constantly These pellets are actually well made and very consistent in size. But it jams my gun constantly. I don't quite understand why this is happening. I have an Umarex Gauntlet .177. I was just trying this out and see if it is accurate or good for the Gauntlet. It is neither accurate nor smooth for loading. So if you have a Gauntlet, stay away from this. Rated 5 out of 5 by Richie from Great so far I only used these pellets a few times but so far they have hit the target. Rated 5 out of 5 by Pete from My rifle didn't like these I have a Ruger Silent Air Hawk (made by Umarex). These pellets gave me lousy 5" groups at 50'. Switching to Stoeger X-Speed Pellets instantly reduced my group size to 1" at 50'. It seems these RWS are too loose for the bore of my rifle, as they slip in very loosely while loading compared to the Stoeger's which require a good deal more pressure to insert. Too bad, as they otherwise look like quality pellets. Rated 5 out of 5 by EDWARD from Pellets are well made, powerfull and accurate. Rated 4 out of 5 by DAVID from pellets are really fast and fairly accurate.